Dr. Igor Jurisica is a Senior Scientist at the Krembil Research Institute, University Health Network, Professor in the Departments of Computer Science and Medical Biophysics, University of Toronto, Adjunct Professor at the School of Computer Science, Queen’s University, and a Visiting Scientist at the IBM Centre for Advanced Studies. He earned his Dipl Ing degree in Computer Science and Engineering from the Slovak Technical University in 1991, MSc and PhD in Computer Science from the University of Toronto in 1993 and 1998, respectively. He currently holds a TIER I Canada Research Chair in Integrative Cancer Informatics. 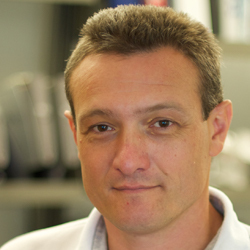 Dr Jurisica’s research focuses on integrative computational biology, and representation, analysis and visualization of high dimensional data generated by high-throughput biology experiments, in the context of Cancer Informatics. Of particular interest is the use of comparative analysis for the mining of integrated different datasets such as protein-protein interaction, gene expression profiling, and high-throughput screens for protein crystallization.